This beautiful CHARM IT! 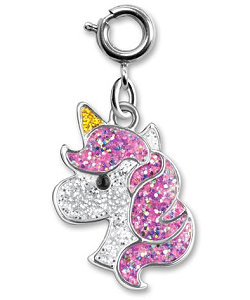 Glitter Unicorn charm adds a splash of magical personality to your charm bracelet with the simple snap of the clasp. With sparkly glitter on her sweet white face and ear, luscious pink mane, and magical golden horn, this shiny Glitter Unicorn charm is a whimsical charm bracelet (or necklace) addition and a definite fashion statement. 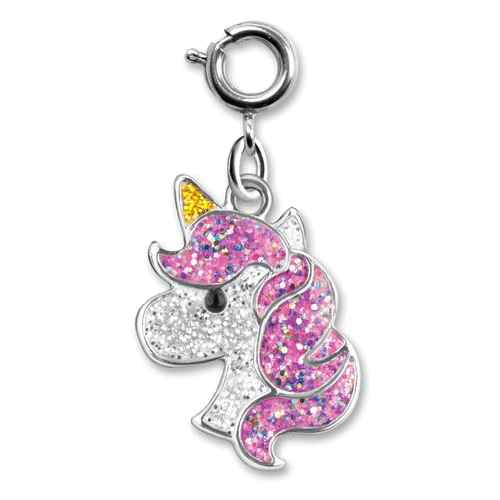 This adorable Baby Unicorn charm has big, sweet eyes, a magical white-tipped purple horn, and a gloriously glittery mane. Add the perfect splash of color and glitter to any bracelet with this beautiful butterfly charm. Heavenly Unicorn has soft white fur, fluffy pink mane and tail, shiny silver horn and big sleepy purple eyes. Sunshine is an adorable plush unicorn with soft white fur, an embroidered smile, and sparkly hot pink eyes. This sweet plush unicorn backpack clip is cuddly with soft hot pink fur, fluffy mane, and smiling face.